Atomic Flounder – From SpongePedia, the biggest SpongeBob-wiki in the world! 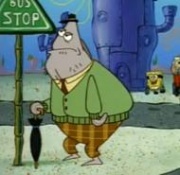 The Atomic Flounder is a retired villain of Mermaid Man and Barnacle Boy. He is seen in the episode Mermaid Man and Barnacle Boy II. In the episode, Mermaid Man points him out to SpongeBob, and tells him that "he doesn't look like much, but he could go back to crime...just like that." That was enough for SpongeBob to attempt to arrest him. This enraged the Atomic Flounder enough to attack Barnacle Boy with his atomic breath. He also appears in The Bad Guy Club for Villains as a younger man. The Atomic Flounder seems to be the only villain that aged unlike Man Ray, the Dirty Bubble, The Moth, the Sinister Slug, the Jumbo Shrimp and Kelp Thing. He is a very light colored flounder. He wears a green sweater over a yellow shirt and red tie, brown plaid pants, a tiny hat and carries an umbrella as cane, but in The Bad Guy Club for Villains he was lavender and his eyes are like aliens and he has a tail and he has no sweater, no umbrella, no plaid pants, no tie, no hat and no shirt, just a thing used for box fights. The Atomic Flounder's atomic ray was possibly taken from Godzilla. He may be related to Flats and/or Brian Flounder. If I weren't retired I'd ROAR! This page was last modified on 28 January 2018, at 03:25. This page has been accessed 96,796 times.